Russian veterans of nuclear disaster control stand ready to assist Japanese teams still fighting overheated reactors at the Fukushima plant. As the catastrophe at the tsunami-hit Fukushima nuclear power plant unfolds, Russia, with its proximity to Japan and vivid memories of the 1986 disaster at Chernobyl, is following developments more closely than most. The question on the minds of Russian experts, and much of the world’s population, is: how bad will this get before it gets better? The good news is that there appears to be no immediate threat of a Chernobyl-scale disaster for Japan and neighbouring countries, according to the crisis centre at Rosatom, Russia’s state nuclear energy corporation. Rosatom has been monitoring the situation since the devastating earthquake and tsunami struck on March 11. “The equipment proved even more reliable than we could have expected. It has coped quite well,” said Rosatom’s director general, Sergei Kirienko, whose organisation has offered assistance to the Japanese. The situation at the fifth and sixth reactors at Fukushima had been stabilised, Mr Kirienko said, and the threat of disaster at other reactors was receding. The bad news is that the plant is still emitting radiation. Gaseous fission material is being emitted into the atmosphere with steam and dust, which is being carried over long distances. And much radionuclide-contaminated water, which is used to cool the reactors, is flowing back into the ocean along with spent nuclear fuel. Atmospheric currents are moving mostly from the Japanese coast into the Pacific Ocean and towards North America, where minuscule traces of radiation have already been detected in Washington and California. In Europe, the first traces of radioactive iodine thought to originate in Japan were registered in Iceland last Wednesday, detected by radiation monitoring stations operating under the Comprehensive Nuclear Test Ban Treaty Organisation. Patrol missions have been set up at 63 points around the world, 15 of which have traced radioactive particles to Fukushima. The International Atomic Energy Agency (IAEA) says that radiation levels detected so far pose no threat to human health and do not require any preventive measures. But it is believed they could potentially trigger ailments among some people at a psychological level. 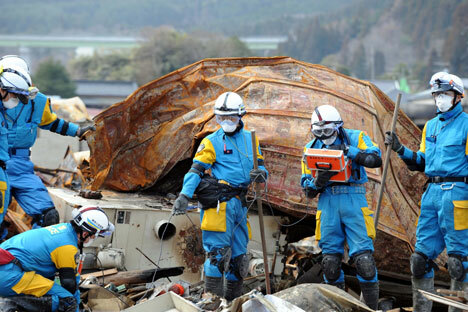 At the disaster scene, radiation levels within the 30km (19-mile) evacuation zone were still 1,000 times above normal, although experts said the situation was manageable. “This is not at all a meltdown – if that had happened we would be seeing a completely different radiation picture at the site and outside it,” said Alexander Bychkov, deputy director of the IAEA. The disaster, triggered when the tsunami swamped infrastructure around the six reactors at Fukushima, came six weeks before the 25th anniversary of the explosion of the fourth reactor at Chernobyl on April 26, 1986. Caused by human error rather than nature, the meltdown at the Ukrainian plant was the worst incident in the history of nuclear power generation. The explosion of the reactor and subsequent fire emitted huge amounts of radioactive substances into the atmosphere and contaminated much of Europe. At least 4,000 people are believed to have died as a result of the disaster, according to the World Health Organisation, and the health of tens of thousands was damaged. The last operating reactor at Chernobyl was only permanently shut down in December 2000. By contrast, the situation at Fukushima more closely resembles the loss-of-coolant accidents at the Hungarian Paks plant in 2003, and America’s Three Mile Island site in 1979. In the broader picture, the nature of the Japanese disaster has implications for industries other than nuclear power generation, according to Nikolai Laverov, the vice-president of the Russian Academy of Sciences. The death toll in Japan is 10,800 with 16,000 missing and the economic cost is put at $205bn (£129bn). Whether Tokyo will yet call on Russian experience to help control the reactors was unclear, but help was at hand, officials in Moscow said. The Russian leadership responded to the disaster by ordering safety checks at all of its own nuclear plants and those built for foreign governments. But there would be no retreat from nuclear power expansion plans, Mr Novikov said.